the retour of the euro-softdrink tour! A very packed week, but filled with interesting meetings and impromptu social clips and plenty of food of thought beyond the bread and butter rat-race…witty discussions, clever views, that’s one of the pleasures of Rome in June: friends but also business partners flock to Rome and make it more exciting! We are going to take it easy in Rome, which is something quite unheard of for locals during the week. We morph in tourists for the weekend, and like them, we are not commuting to Tuscany in tight air-conditioned car-sauros wearing Tod’s loafers but rather seize the best of Rome in Birkenstock style. We’ll be spotting the first cinema en plein air venues, and we planned brunches in the shade for today and tomorrow. Friends in Berlin and London: please send us a bit of proper rain showers and we’ll give you plenty of sun we can part with. Reading the morning papers in yet another good cappuccino place with the metallic smell of dust being moist by the first fat drops of rain is a pleasure in the summer. “What would win your heart – an alluring first impression or a tempting parting glance? For Tyler Brûlé it was the latter that had him dreaming of relocating the Monocle team to Berlin and bagging a summer retreat”. Categories: Berlin, Sense of Place, Softdrinks and Trains! Well, it’s bloody cold outside – also in Rome, not only in Bavaria and Austria Felix yesterday! – so to talk about regional soft-drinks seems a bit odd. 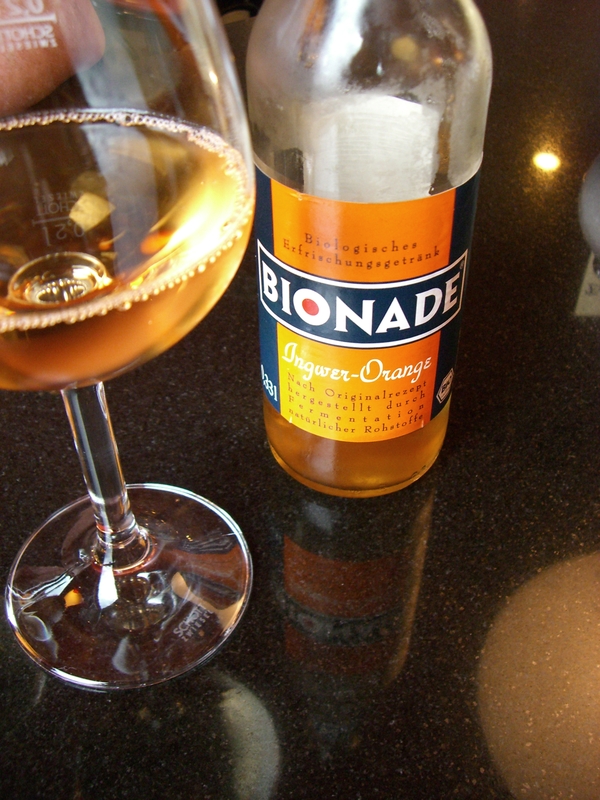 Still, it was a pleasure anyway that I could order at the Bistro on my Munich-Wien train not the usual uber-sweet multinational softdrink, but the mythical and definitely healthier Bionade! I like the metal cap, it reminds me for some reason of Style Council…If you look at the pavements in Berlin it happens sometimes to see the target-like blue/white/red metal caps without any logo…after a few days in Berlin you will know where they come from! If Triest is the northern-limit of the olive-tree, Lugano is the southern-limit of the Bionade: you can still find it in the stores. But I never saw it in other locations this side of the Alps. That’s good. Too much globalization kills the charme and the sense of place! Be it gazosa in Ticino, Bionade in Germany and Chinotto in Rome! The european tour of regional soft-drinks continues, with two black beauties…stay tuned! Categories: DividedCity, Friends, multikulti, Softdrinks and Trains! Tags: DividedCity, Gazosa, multikulti, Trains! No planes for these holidays, just trains. The best part is starting now, in CH. 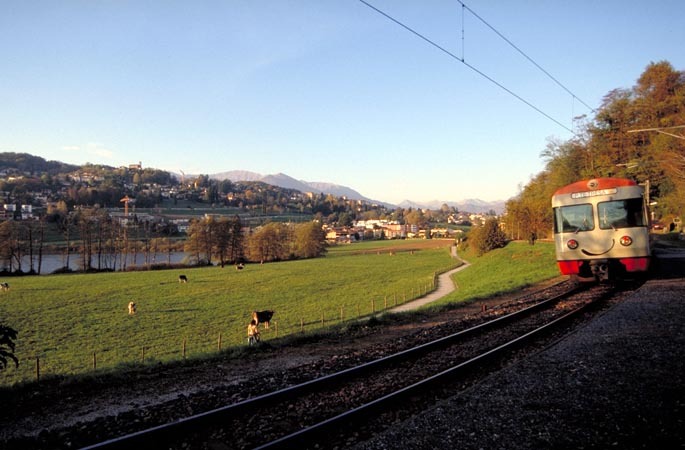 The charming orange trenino connecting Lugano and Ponte Tresa is a bijou managed and taken care of by the crew as if it was some sort of giant pet. Freshly polished every week by the giant brushes at Ponte Tresa station, it rolls quietly every 20 minutes. Ponte Tresa is a divided city, with an italian side and excellent pasticceria and a Swiss one with its reassuring train time tables and reliable post-office, plus beautiful views of the lake to share. The best are the ones sold in bars and restaurants. 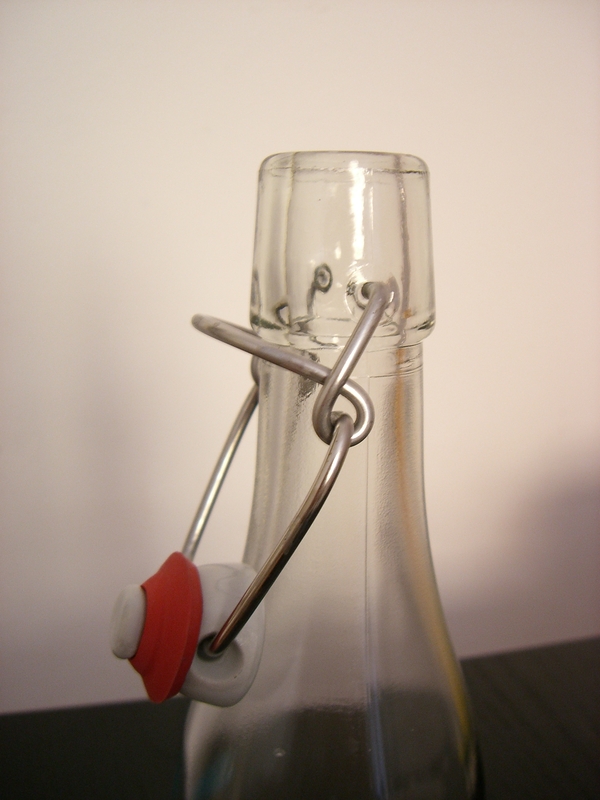 The bottles have the macchinetta, a mechanical ceramic-rubber-steel cap. Re-usable, resistant, re-closable, re-everything. 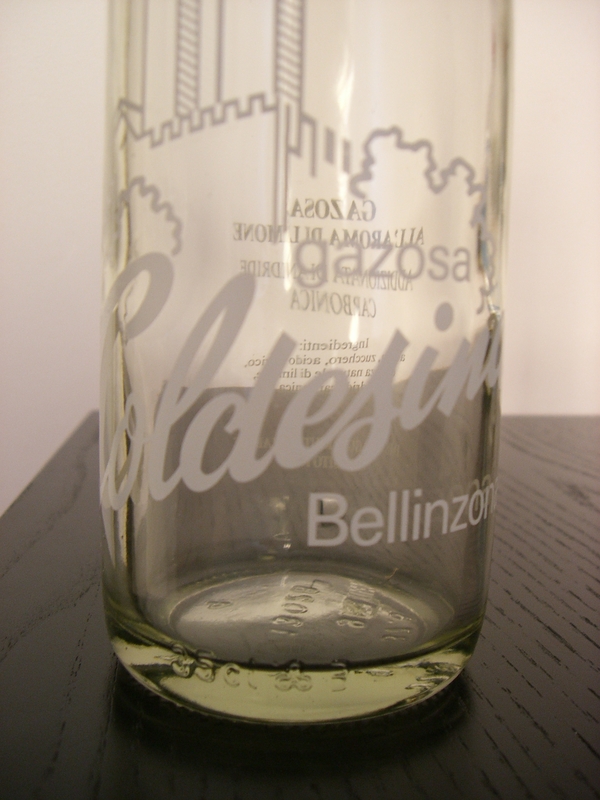 The labels are engraved on the bottle and the disegns are nice. Very swiss environmental-friendly, very italian 60s buonsenso. 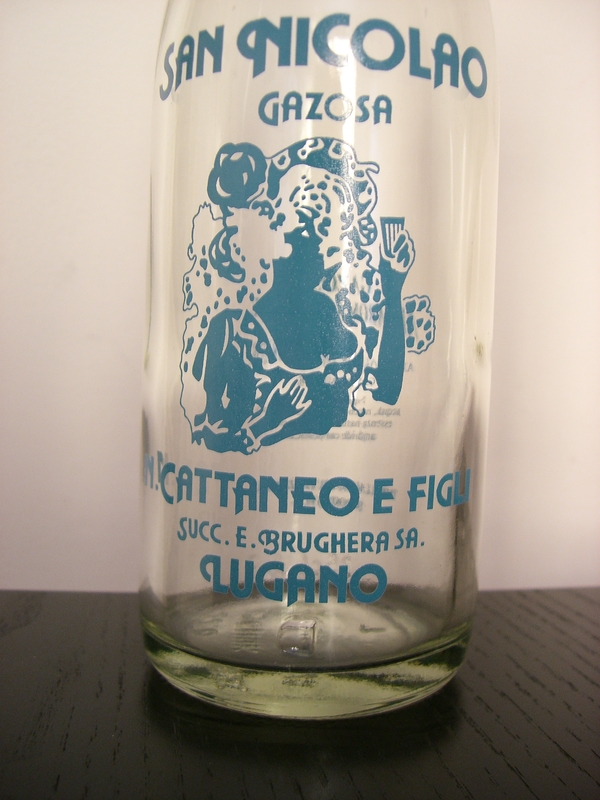 Another excellent and very local soft drink…what a pleasure when, snapping the macchinetta backwards, the cap pops with a bang and a misty cloud!